The big question: Does category.php apply to the children of the targeted category? The answer: No. So now what? For those not familiar with the power of category.php within a theme, you can catch up here. In a nutshell, you can apply a custom template to a specific category just by naming the template file with a convention that gets automatically picked up by WordPress. It’s a really awesome feature to take advantage of, but there’s one problem. Category.php will not apply to the category’s children/sub-categories. So then, how do we apply a template to sub-categories? After lurking around online to find forum threads like this, and brainstorming with a co-worker of mine, I found some solutions to the problem and wanted to share them. Editing the loop within category.php to use the conditional tags, in_category() and is_category(). Let’s imagine that you want to change the loop itself in your category.php file so that it uses your custom template when a post is in a parent category and/or it’s children. Since it’s just the “loop” file that I want to change, particularly, get_template_part() depending on the category, I’m going to go ahead and make a copy of content.php and called it content-custom.php. Now that we have our file, this is what we want in plain English before we put it out in code. I find that it helps when I can just say what I want before writing any logic. If this IS the category WordPress OR if this is IN the category WordPress (it’s children), choose this custom file I created. If not (else), continue down your default route. So let’s get writing this with code! We’re going to replace “STUFF IS GOING HERE NEXT” with our conditionals: is_category(‘wordpress’) and in_category(‘wordpress’). Then enter the if statement: If this IS the category “wordpress” OR if this is IN the category “wordpress”, then get template part content-custom.php. Keep in mind that we’re using the slugs of the categories, hence the lowercase in “wordpress”. Else if none of these conditions are met, get template part content-whatever-post-format-matches.php which is the default. Now this solutions works awesome, but there’s another way to explore! Let’s move on to Solution 2. Editing the loop within category.php to use the function, cat_is_ancestor_of();, in an if/else statement. What’s going on now, is instead of using the conditional tags we had before, that generally just check whether the post either IS the category WordPress or IN the category WordPress (a sub-category), this is checking only for a sub-category, a child. If category 3 is the ancestor/parent of 10 – then the if statement continues, if not, then it will fall into the else part of the statement. Woops, looks like I wrote “tutorials” with an s in the PHP comments, for the sake of preventing confusion, the slug of the sub-category is tutorial, not plural. No ‘s’ at the end. This has been corrected in the code I’ve pasted even though the screenshot shows that wrong. Now, the above works just fine, but there are two problems with our solution. This assumes that you’re checking for a specific sub-category since you’re only providing two category IDs, the parent and the child. So this might not be the best solution if there are going to be many sub-categories to check for, or the user might endlessly add more sub-categories. If you need to check for multiple sub-categories or want to ensure this works in the event that your user adds more sub-categories that you hadn’t planned for, stick with Solution 1’s code instead. It also makes for cleaner code rather than adding more “Or”s to check every single sub-category with cat_is_ancestor_of. This may or may not be a concern for some if this is your personal site or a site for a client, but the cat_is_ancestor_of function is using the category IDs. Why can that be an issue? Well, if the site ever gets moved to another server or moved in general and it’s not using the same database, those IDs can change. And then that just breaks any logic you have assigned to these numbers. If those categories have names that likely won’t ever change, then what will future-proof our code in the event that the site moves, is ensuring that it’s using the category slugs instead, NOT the IDs, the same way we’re using the slug for is/in_category. But the cat_is_ancestor_of function only accepts IDs, not slugs. And so this is what we want to do. Get category by the slug we provide. Once we have the category, get the ID of this category. Then plug in this ID into our cat_is_ancestor_of function. We can do all of this using the handy function, get_category_by_slug();. 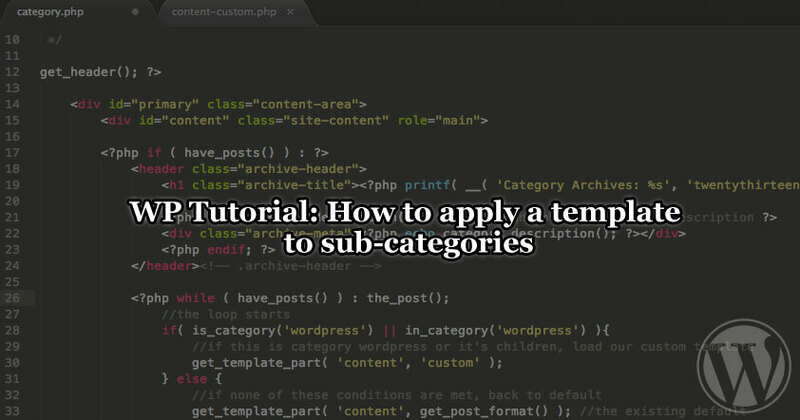 Before the loop starts, and staying within the PHP tags, we add in this snippet, assuming that in our case, we’re still using the parent category “WordPress” and it’s sub-category, “Tutorial”. Once we have the IDs and stored them into variables, we can insert them into our if statement for cat_is_ancestor_of. //testing 123, if you see these numbers, then you're getting stuff! Well, that was a long one! Keep in mind that you don’t necessarily have to wrap these if statements around the loop, you can wrap the entire contents of the file or wrap pieces of other files – whatever suits your needs. Hopefully this tutorial provides you the tools you need to understand how it works so you can apply the technique as you see fit. If anyone has suggestions for alternate solutions I haven’t thought of, or ways to make this code more efficient, I’d love some feedback. I love talking about WordPress, and if I’m wrong in one of my tutorials, then hell yeah, I’ve learned something and will definitely make sure I post the result so others can learn as well. 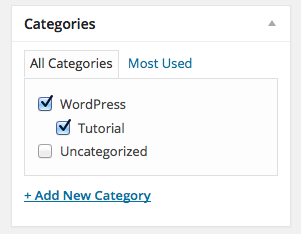 Make your subcategory archives look different than your category archives in #WordPress. Previous Post WordPress 4.0 is out! Hi this looks interesting, however i´m a noob in php and my problem is i guess i need this for my woocommerce test-site…. the point is that i try to make restaurant menus and i came a wide way with woocommerce and use this system as a menucart but now i become an issue with a product category where i work with sub-categories. i made a custom template from “taxonomy-product_cat.php” and name this “taxonomy-product_cat-getraenke.php”, the template works fine for just the Parent Category, but nothing happens for the sub-categorys, the system takes “taxonomy-product_cat.php”. i know i can make several templates like taxonomy-product_cat-cold-drinks.php, taxonomy-product_cat-hot-drinks.php, and so on but this is kind of stupid, can you help me with the right code and tell me where to write this please?